The name and work of stained glass artist A. Kay Herbert first became known to us in 1993 when the windows of Historic Little Rock Missionary Baptist Church in Detroit were registered in the Michigan Stained Glass Census by Silvio Benvenuti. 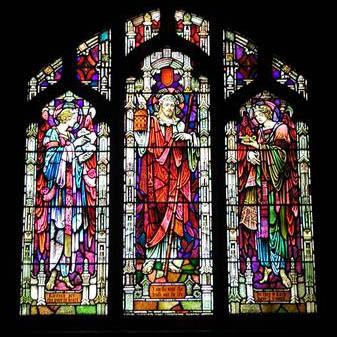 Three windows designed by Herbert had been installed in 1928, 1929 and 1932, when the building was known as Central Woodward Christian Church. They included two large portrait windows of George Washington and Abraham Lincoln for the nave and a window depicting Jesus with the Children, installed in the church library. According to a book written in 1948 by the church pastor, Edgar DeWitt Jones, the windows portraying Washington and Lincoln had cost $3000 each. Little else was known about the artist at this time. Left: Washington Window. Historic Little Rock Missionary Baptist Church, Detroit, MI. A. Kay Herbert, 1932. MSGC 93.0113. Photo by Silvio Benvenuti. Right: Lincoln Window. Historic Little Rock Missionary Baptist Church, Detroit, MI. A. Kay Herbert, 1929. MSGC 93.0113. Photo by Silvio Benvenuti. Chancel Windows. Trinity United Methodist Church, Grand Rapids, MI. A. Kay Herbert, 1922. MSGC 97.0015. Photo courtesy of Trinity United Methodist Church. 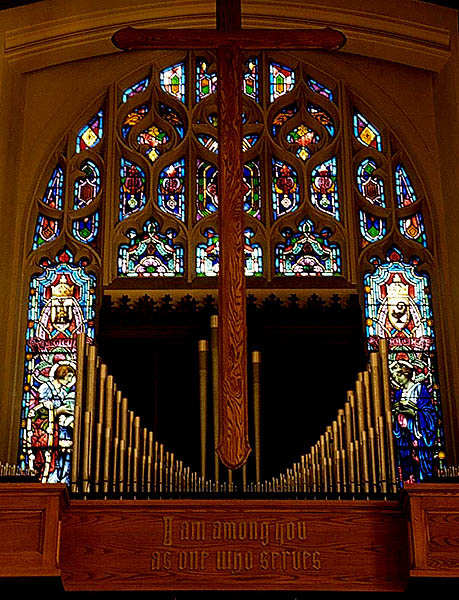 Chancel windows, designed by Herbert in 1922 for Trinity United Methodist Church in Grand Rapids, were registered in 1997 by Thomas Poelman. These include figures of a medieval knight and a woman reading in panels on either side of the central organ, with smaller decorative panels filling the arched opening above. No additional information about Herbert was provided, but their location indicates that he designed windows for Michigan buildings outside of the Detroit area. Christ Holding Lantern Window. Woodmere Cemetery Chapel, Detroit, MI. A. Kay Herbert, 1930. MSGC 06.0023. Photos by Tom Koselka. In 2006 another Herbert window, created in 1930 for Detroit's Woodmere Cemetery Chapel, was registered in the Census by Gail Hershenzon. 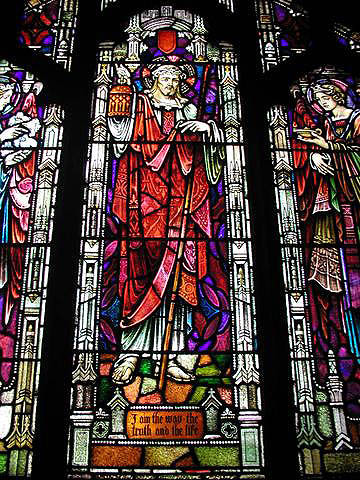 The signed and dated three-panel window depicts Christ holding a lantern in the central panel, flanked by red-winged angels on the two side panels. Its registration was soon followed by photographs of windows made by Herbert in 1923 for Most Holy Redeemer Church, also in Detroit. Two of these windows show similar female forms kneeling in prayer. Other windows made by Herbert for the church depict the evangelists Matthew, Mark, Luke and John. Left: Kneeling Saint Window. Most Holy Redeemer Church, Detroit, MI. A. Kay Herbert, 1923. MSGC 06.0024. Photo by Tom Koselka. 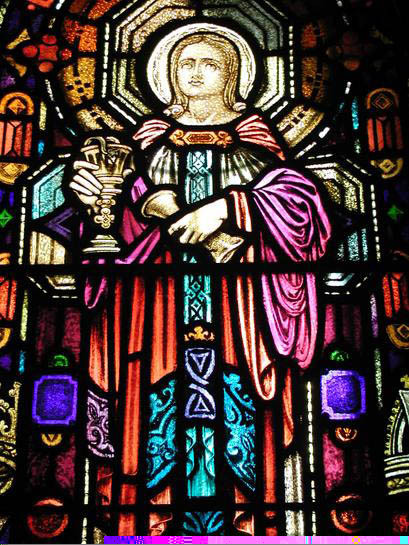 Right: St. John Window (detail). Most Holy Redeemer Church, Detroit, MI. A. Kay Herbert, 1923. MSGC 06.0024. Photo by Tom Koselka. 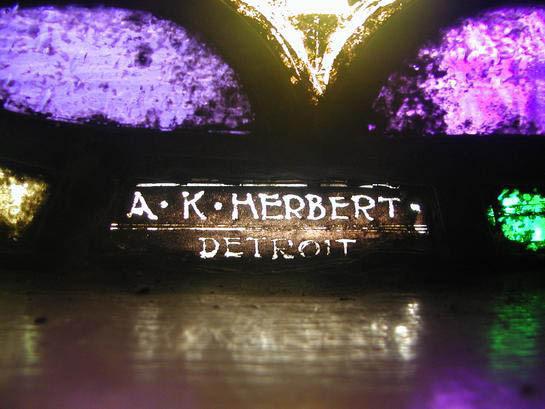 Tom Koselka, who photographed the windows at Woodmere and Holy Redeemer, found newspaper articles about Herbert in the Burton Historical Collection of the Detroit Public Library. We learned from these and other sources that Alex (or Alexander) Kay Herbert was trained in his native Scotland, worked for William Morris Studios in London, came to the United States in 1910 or 1911 and arrived ca. 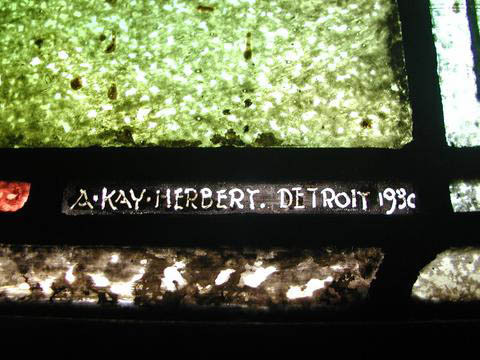 1920 in Detroit, where he established his own studio, A. Kay Herbert Stained Glass, at 619 West Larned Avenue. 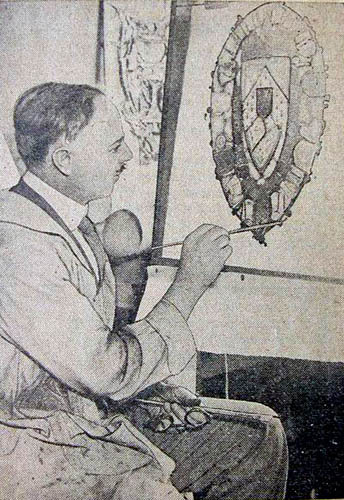 The 1930 U.S. Census gives Alexander Herbert's occupation as stained glass artist, his age as 52, and his birthplace as Scotland. His wife, Mary A. Herbert, is listed with her age as 42 and her birthplace as Northern Ireland. In the Detroit City Directory for 1939, she is listed as his widow. Apparently Herbert died in the 1930s but no death record for this artist has yet been found. A. Kay Herbert. The Detroit Free Press, April 24, 1932. Further research has resulted in conflicting information about Herbert. In searching Scottish birth and census records, Rona Moody of Derbyshire, England, found Alexander Herbert born in Glasgow in 1872, married to Janet Brown in 1899, listed as a glass designer when his daughter Margaret was born in 1900, and living in Glasgow with his wife and daughter in the March 1901 census, where his age is given as 28. The puzzling discrepancies between the U.S. and Scottish census records concerning Herbert's age and his wife's name remain to be solved. Left: Joan of Arc Window. Christ Church Cranbrook, Bloomfield Hills, MI. A. Kay Herbert, 1931. MSGC 94.0158. Photo by Shirley Dow Marthey. 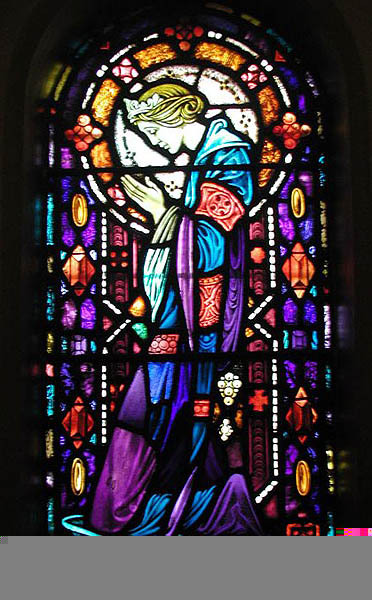 Right: Female Saint Window. Christ Church Cranbrook, Bloomfield Hills, MI. A. Kay Herbert, 1931. MSGC 94.0158. Photo by Shirley Dow Marthey. The Herbert windows thus far discovered reveal his distinctive style reminiscent of the Arts & Crafts designs of the William Morris Studios. His graceful female figures reminded us of two windows included in the 1994 registration of windows at Christ Church Cranbrook in Bloomfield Hills. These windows, which represent Joan of Arc and an unidentified female saint, had been attributed to an unknown artist. More research by Cranbrook Educational Community's Archivists Mark Coir, Diane Schmale and Leslie Edwards found evidence in the papers of Cranbrook founder George Gough Booth to indicate that Mr. Booth purchased the windows from A. Kay Herbert in 1931 for $125 each and then donated the windows to Christ Church Cranbrook. 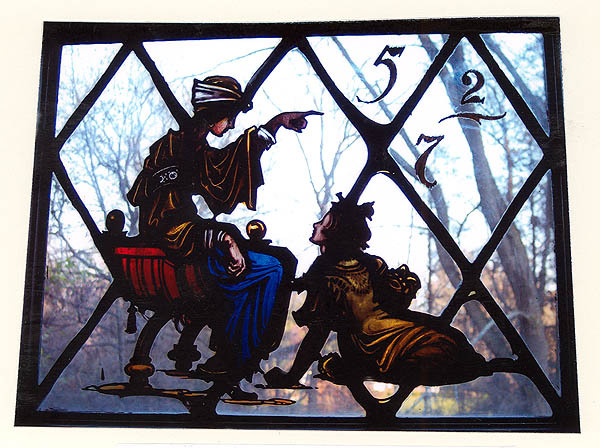 Booth's papers also document his 1923 purchase of five stained glass panels from Herbert for the windows of Cranbrook's Brookside School for children. These small panels depict scenes related to children's learning experiences in music, friendship, geography, drama and mathematics. They were purchased for $50 each for a total of $250. 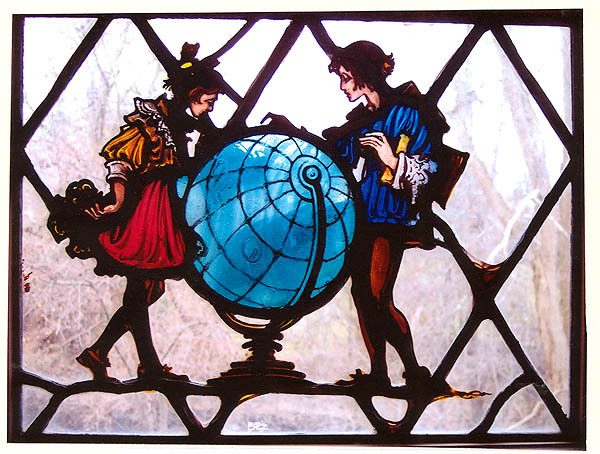 Left: Geography Window. Brookside School, Cranbrook Educational Community, Bloomfield Hills, MI. A. Kay Herbert, 1923. MSGC 06.0017. Photo by J. William Gorski. Right: Mathematics Window. Brookside School, Cranbrook Educational Community, Bloomfield Hills, MI. A. Kay Herbert, 1923. MSGC 06.0017. Photo by J. William Gorski. Additional research has indicated that Herbert also designed windows for Detroit schools, a country club, the Masonic Temple and the Detroit-area homes of prominent citizens, but these have not yet been identified. We are indebted to Silvio Benvenuti, Thomas Poelman, Gail Hershenzon, Tom Koselka, Mark Coir, Diane Schmale, Leslie Edwards, J. William Gorski and Rona Moody for their invaluable help in documenting the life and work of A. Kay Herbert. The quest for A. Kay Herbert continues as we search for more information about this elusive stained glass artist. "An Artisan Plies His Trade: Bits of Glass Form Work of Art Under His Fingers." The Detroit Free Press. 24 April, 1932. "Bacchus Window, Grosse Pointe Country Club, Albert Kahn, Architect, Designed and Executed by A. Kay Herbert. Plate 49." Michigan Architect and Engineer, 1929. Cranbrook Archives, Bloomfield Hills, MI. George Gough Booth Papers (1981-01), Box 21, Folder 4, dated June 4, 1931. Cranbrook Archives, Bloomfield Hills, MI. Cranbrook Foundation Records, RG I: Office Files (1981-05) dated Aug. 12, 1931. Folder CAA. Art Collection. Purchase Records, "H", 1930-1946. Cranbrook Archives, Bloomfield Hills, MI. Brookside School Records (2002-04), dated November 9, 1923. Detroit City Directory. Detroit, MI: R. L. Polk & Company, 1929, p. 1069. Illustrations of designs for new windows made by Herbert for Most Holy Redeemer Church. The Detroit Free Press. 1 April, 1923. Jones, Edgar DeWitt. Lincoln and the Preachers. New York: Harper, 1948. Moody, Rona. "Stained Glass in Scotland: A List of Artists and Studios with Work in Scotland." Washington, D.C.: National Archives and Records Administration, 1930. U.S. Bureau of the Census. Fifteenth Census of the United States, 1930. Year: 1930; Census Place: Detroit, Wayne, Michigan; Roll: 1052; Page: 16A; Enumeration District: 481; Image: 33.0. ONLINE. 2007. Ancestry.com. [2 May 2007]. Text by Betty MacDowell, Michigan Stained Glass Census, May , 2007.